Without doubt, the worst twin-engined combat aircraft to emerge from Germany’s wartime industry was the Messerschmitt Me 210, which started life as a 1937 project for a multi-purpose aircraft to replace the Bf 110. Even at this early stage of its development, the latter aircraft, which had flown in 1936, was showing ominous signs that it would not reach its projected performance expectations and would probably not be wholly adequate for the long-range heavy fighter role for which it had been designed. A Reichsluftministerium (RLM) specification was issued to cover the new design and three companies – Ago, Arado and Messerschmitt – submitted proposals. However, the Ago design, the Ao 225, was technically too complex and the company was experiencing financial problems, which led to its early abandonment. 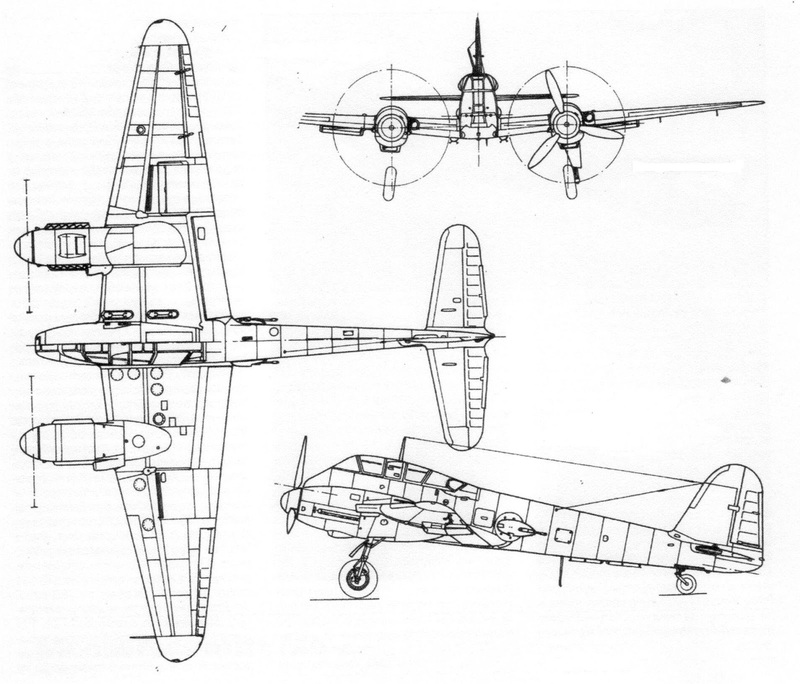 The other two designs, the Arado Ar 240 and the Me 210, were approved while still on the drawing board. The Ar 240 first flew in May 1940; the first four prototypes were fighters, the next four reconnaissance aircraft, and the final one a night fighter. The initial production model, the Ar 240A-0, was a high-altitude reconnaissance aircraft, while the Ar 240B-0 was built in both fighter-bomber and reconnaissance versions. 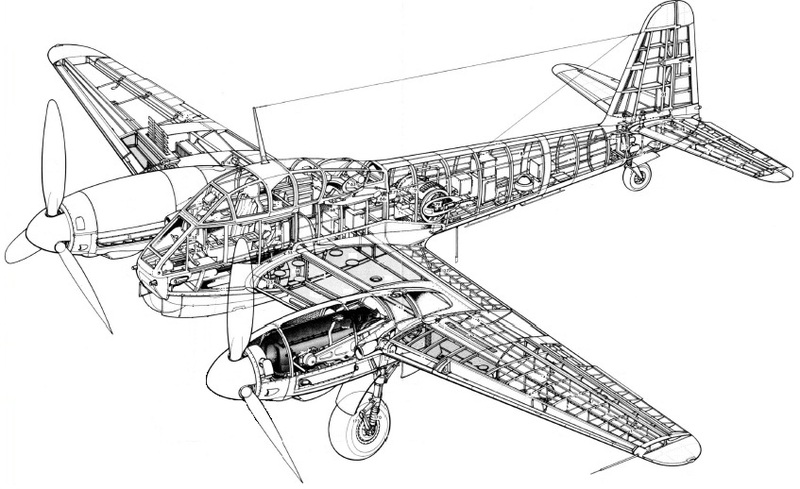 The Ar 240C was a projected multi-role model, while the Ar 240E and F were respectively bomber and fighter developments. During operational trials, Ar 240A-0s made reconnaissance sorties over England and Russia. However, the type suffered from continual handling problems, and after limited use in the reconnaissance role it disappeared from operational service, plans for large-scale production having been cancelled in 1942. The Me 210V-1 prototype flew for the first time on 2 September 1939, powered by two 1100 hp Daimler-Benz DB 601A engines. This aircraft, and the two subsequent prototypes, were originally fitted with twin fins and rudders. However, early test flights revealed marked longitudinal instability and these features were replaced by a large single fin. The V2 and V3 prototypes also had a redesigned cockpit. They were fitted with mock-ups of the Rheinmetall-Borsig FDL 131 remotely controlled defensive gun barbettes on either side of the fuselage aft of the wing trailing edge, the cockpit canopy being bulged so that the gunner could see downwards and to the rear. It had a large bomb bay in the nose, which could accommodate up to 2200 lb of bombs or alternatively six 20 mm cannon. For the dive-bombing role, the aircraft was fitted with a Stuvi 5B bomb sight. Although the single fin and rudder arrangement improved the Me 210’s flight characteristics somewhat, it still continued to display some seriously bad habits, including a tendency to stall at the slightest provocation. At high angles of attack, or in a turn, a stall would develop into a vicious spin. … was nearly as bad as Heinkel’s He 177, surely the worst plane we produced in Germany throughout the war years. I was never happy about the Me 210. I have only been forced to bale out of an aircraft twice, and the first time was from this twin-engined fighter-bomber. It was on 5 September 1940, that I took off from Augsburg-Haunstetten in the Me 210V-2. We had more than a suspicion that the tail assembly was weak, and that there was a strong possibility that it would part company with the rest of the airfame in a dive. I was flying solo, the mechanic who usually occupied the radio operator’s seat on test flights being left on the ground as this flight was likely to be more than usually dangerous. During the climb I recall the thought flashing through my mind: ‘If something goes wrong, remember to avoid baling out over the forest.’ At 9000 feet I checked my instruments and started the planned series of dives, my unpleasant thoughts temporarily forgotten. Stick forward … down went the nose and the needle began to creep round the airspeed indicator. Stick back, and the nose lifted. Stick forward … back … forward, and so on. One more shallow dive and back to the airfield. A thousand feet showed on the altimeter and I began to level off. Then it happened, and right over that blasted Siebentischwald again! The plane shuddered, the tail fluttered, and bang, the starboard elevator broke off! Immediately the plane went into a half-loop downwards. Before I could gather my wits I was flying on my back in the direction from which I had just come. I knew exactly what would happen now, as I had seen the same thing happen to the first prototype some weeks before. The plane would fly inverted for several seconds and then dive straight into the ground. Hanging on my seat straps, head downwards, I automatically grabbed the release pin, but I hadn’t jettisoned the canopy. In that split second I fumbled for the roof’s emergency release lever, pulled it, and the canopy flew off with a bang. I pulled the release pin … the chute opened with a glorious crack. I looked down, and there were those damned trees almost touching my feet. But I was in luck, for the wind blew me towards the only clearing that I could see, and I escaped with nothing worse than a sprained ankle. I had lost a prototype, but at least I had proved its unstatisfactory characteristics and had lived to tell the tale. But there are few things in the world harder than proving to an aircraft designer that his latest pet creation in simply not good enough. Despite the dangerous shortcomings that became apparent during the testing of the Me 210 prototypes, the RLM ordered a batch of pre-production Me 210A-0 aircraft. They were intended for Erprobungsgruppe 210 (EGr 210), the special Luftwaffe unit that had been formed at Köln-Ostheim under the command of Hauptmann Walter Rubensdörffer on 7 July 1940 for the specific purpose of pioneering the Me 210’s entry into full operational service. 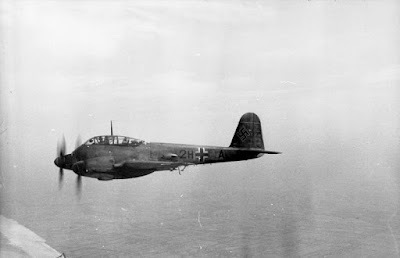 One of the unit’s Staffeln, I/EGr 210, was equipped with the Messerschmitt Bf 110C, and was activated by simply renumbering I/Zerstörergeschwader 1 (I/ZG 1); similarly, III/Stukageschwader 77, which was armed with the Messerschmitt Bf 110D, became II/EGr 210. 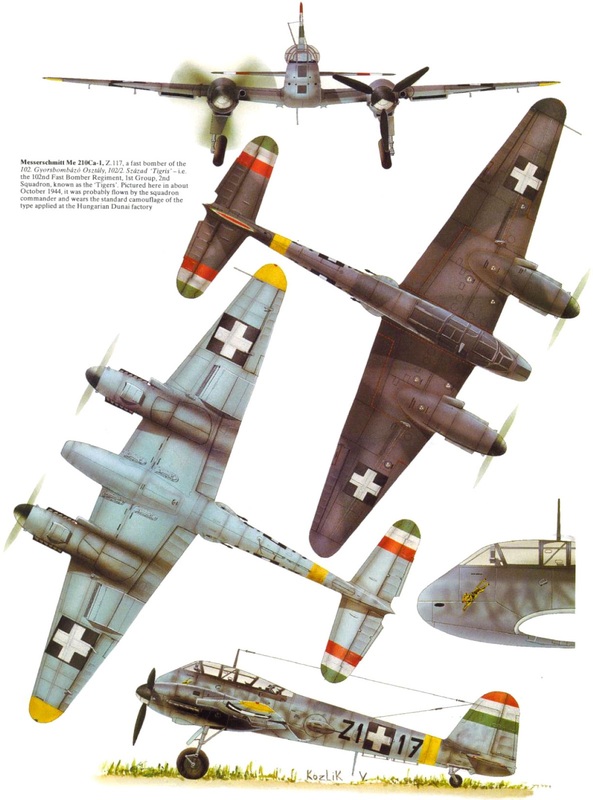 The group’s third Staffel, equipped with Messerschmitt Bf 109Es, was previously IV/Trägergruppe 186, which had been designated as the fighter element of the air group intended for the aircraft carrier Graf Zeppelin, on which work had been halted. EGr 210 had been operationally active during the Battle of Britain, carrying out precision attacks on targets such as radar stations and RAF airfields, and the losses sustained by its Bf 110 fighter-bombers had served to underline the fact that the type was outmoded. EGr 210 received its first Me 210A-0s at the end of 1940, but although the unit was still based in the English Channel area, the new aircraft were not used operationally against the British Isles. In April 1941 the unit was redesignated Schnellkampfgeschwader 210 (SKG 210), and a month later it moved to Poland under Major Walter Storp for the start of the campaign in Russia. In April 1942 it was absorbed into Zerstörergeschwader 1, disbanding in July 1944. The first unit to use the Me 210 operationally, in fact, was Zerstörergeschwader 1, whose II Gruppe equipped with the type late in 1941 and served on the Eastern Front. The Me 210 was also operated by 10/ZG 26 in Tunisia and III/ZG 1 on the Italian front. There were two major production sub-types, the Me 210A-1 heavily armed ‘destroyer’ and the Me 210A-2 fighter-bomber; four examples of a photo-reconnaissance variant, the Me 210B-1, were also built, and these served with 2(F)/122. The Me 210 was also built under licence in Hungary, and was used by the 102nd Fast Attack Bomber group of the Royal Hungarian Air Force. Most of the Me 210s built in Hungary were the Me 210C variant, which was basically an A or B model with 1475 hp DB 605B engines. About two-thirds of the Hungarian production went to the Luftwaffe. In April 1942, production of the Me 210 in Germany was halted after only ninety aircraft had been delivered to operational units, a decision dictated by the aircraft’s phenomenal accident rate. Production was resumed in July, after the aircraft had been fitted with leading-edge slots, a modification that substantially improved its flight characteristics. In the summer of 1942 an experimental unit designated Versuchstaffel (Trials Squadron) 210 formed at Soesterberg, Holland, for operations against the British Isles. This unit became operational as 16 Staffel/KG 6 in August. On 13 August 1942, the first Me 210 to be shot down over England was destroyed by Flight Lieutenant A.C. Johnston, flying a Hawker Typhoon of No. 266 Squadron; the combat took place east of Cromer. Two more Me 210s were shot down by Typhoons of the same squadron on 6 September, off the Yorkshire coastal resorts of Robin Hood’s Bay and Redcar. It was the end of the Me 210’s brief and unspectacular combat career against Britain. Late in 1942, after 352 examples had been built, production of the Me 210 switched to an improved version, the Me 410 Hornisse (Hornet). This aircraft was essentially an Me 210 incorporating all the latter’s hard-earned modifications and equipped with two Daimler-Benz DB 603A engines. As well as being used in the fast bomber role, the Me 410 was used as a night fighter and a bomber destroyer, being armed with a 50 mm cannon in the latter case. We can see a measure of what they might have achieved, had these aircraft been committed in greater numbers, in one attack on American air bases in East Anglia on 2 April 1944. Me 410s destroyed thirteen B-24 Liberators and, in the panic, two more were shot down by their own airfield defences. The Germans lost a single Me 410. By the beginning of 1944, however, further improvements in the British air defences had made it hard for the Luftwaffe to penetrate UK air space at medium and low level. Increased numbers of antiaircraft guns of all calibres, rocket batteries capable of firing salvoes of 128 missiles, and radar-directed searchlights able to illuminate targets up to 35,000 feet all contributed to frustrating the attackers. The fast enemy bombers now began to penetrate at altitudes up to 30,000 feet before diving on their objectives and making a high-speed exit. These new tactics caused problems for the British night fighters, since following an enemy aircraft in a dive meant that radar contact was often lost because of ground returns. The answer was to extend the night-fighter patrol lines well out to sea; many intruders were trapped and destroyed in this way. Between 13 July 1943 and 5 June 1944, forty-three Me 410s were shot down by Mosquito night fighters during night operations against England; many more were to be destroyed during subsequent operations over the Continent.